When I got started in the world of index investing, there was a lot to learn. I had decided to go with the TD e-Series Index Funds as my investment vehicle and using my TD TFSA Mutual Funds account to do the investing (as opposed to a TD Direct Investing account). There were some good guides to get the account started, but I couldn’t find specific instructions on how to use the TD EasyWeb website to start purchasing my TD e-Series Index Funds. *UPDATE: TD has now updated their website to indicate that in-person representatives are now available to help setup a TD e-Series account. This is the easy part. 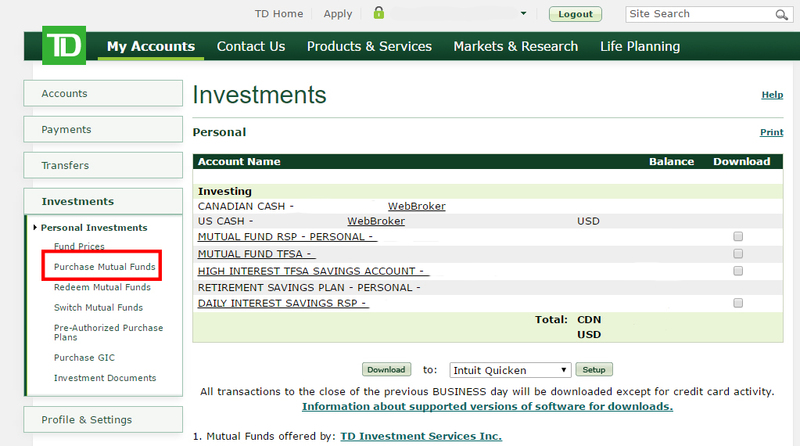 You can purchase the TD e-Series index funds through the same EasyWeb portal that you do your regular online banking. Once logged in, click on the ‘Investments’ section on the left hand menu. This page will list all of your different investment accounts, and you will see your Mutual Fund TFSA and Mutual Fund RSP. 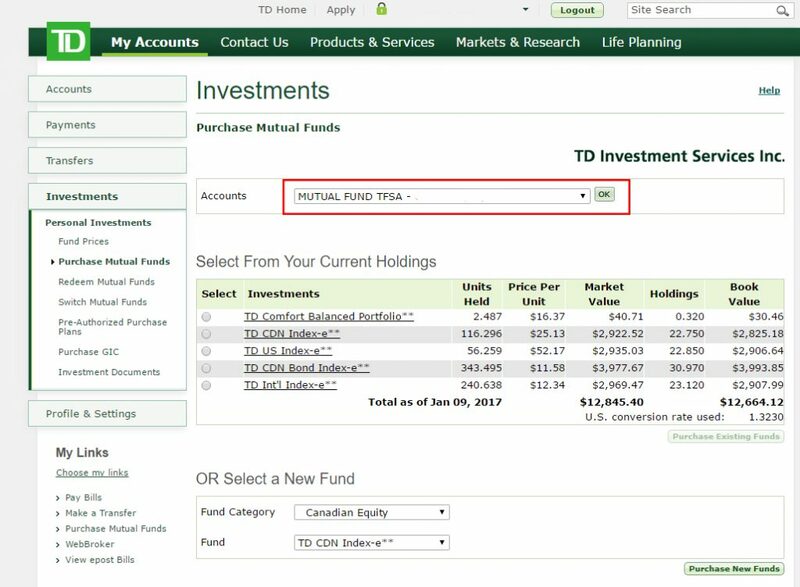 Unfortunately, TD doesn’t show any distinction if your account has been converted to an e-Series account, it is still just listed as ‘Mutual Fund RSP’ or ‘Mutual Fund TFSA’. Click on the ‘Purchase Mutual Funds link’ on the left hand menu. Ensure that you are purchasing through the correct account by selecting the account you wish to use at the top and selecting ‘OK’. Make sure you select the funds that include the ‘-e’ at the end! You will only have to do this the first time you purchase each fund – after that you will be able to buy additional funds by selecting them from your Current Holdings. Once you’ve selected the correct fund, press the ‘Purchase New Funds’ button at the bottom of the page. Once you’ve selected the fund you would like to purchase, you will need to fill in your details. Make sure you double check everything! Check the account that you are purchasing into, the fund category and fund name, and input the dollar amount that you would like to purchase. Also fill in your email address and daytime phone number. Once this all looks right, select ‘Next’. Your order has now been submitted! You can repeat this process for each of the index funds that will make up your portfolio. Purchases made after 3:00pm ET will be processed at the next business day’s closing price. Even if you make the purchase before 3:00 ET, the index fund purchase won’t show up until the next business day. You will receive an email indicating that a purchase has been made, but it won’t provide any details about the purchase. Where does the money for the fund purchase come from? Mutual Fund purchases will come from the main account associated with your EasyWeb online banking account. For me, it’s my main chequing account associated with my debit card. Congratulations! You have now made your first purchase of TD e-Series Index Funds. It’s a simple process once you get used to it, but it’s nice to see an example for your first time, especially when you are moving around large amounts of money. Since then people who have done it suggest that when you make the appointment you tell them that you want to set up an e-series portfolio. If you are an existing TD client they may even have some of the paperwork done before the appointment. That’s a good point. It seems like in the few month’s between now and when I converted to an e-Series account, they’ve opened up their process a bit and have made it easier to do. When I had signed up I had heard many testimonials of TD bank employees not even knowing what a e-Series account was. Glad to see they are making it easier for people to get invested in these low cost funds. I’m going to purchase e-Series funds and I already have converted RRSP account for that. Currently the money is on another savings RRSP account. My question is how can I select what account the money will come from? Is your money currently in another savings RRSP account at TD, or is it at another bank? 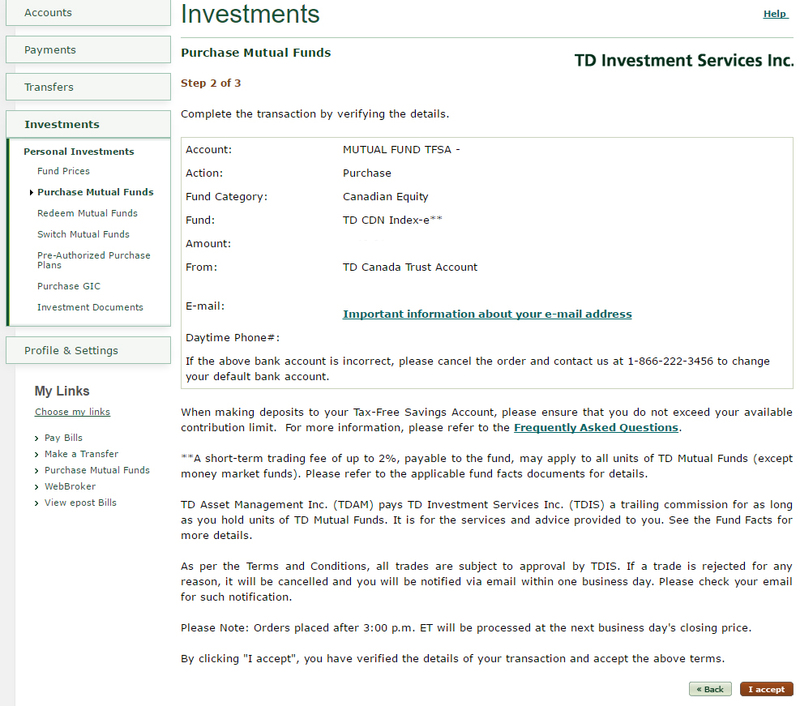 Unfortunately you can’t manually pick which account your e-Series mutual fund purchases come from, TD associates your purchases with a single account (usually your main chequing account), and every time you make a purchase, it automatically comes from that account. Instead, to avoid any tax penalties by withdrawing from your current RRSP to make the switch to e-Series funds, you’ll have to call into the TD Easy Line, and talk to a representative to get them to make the switch between RRSP accounts for you. Not as easy or convenient, but if this is just a one time switch to get things going, should get the job done. Hope that helps, good luck with your e-Series portfolio! Hi, In your pictures, I see a field called the U.S. Conversion rates used. What does that mean? Will the money that I invest get converted to U.S. dollars and stocks/bonds are purchased? When you invest in TD e-Series funds, there won’t be any conversion of currencies between Canadian and US dollars. You buy in CDN and sell in CDN, so you don’t need to worry about losing any funds to currency conversion. Hi. I see the footnotes on the example snapshots include lines about a short-term trading fee of up to 2%, trailing commissions, etc. Have you encountered any of those with your real portfolio? No, all of the fee’s are built into the price of the stock so I’ve never seen any extras come off. It is true though that if you sold some of your funds within (I believe) 30 days of buying it, that’s where you would see a 2% short-term trading fee, but I’ve never turned around any of my buys in that timing. I notice it doesn’t give you the option of automatically re-investing the dividends, which I believe it does ask you when buying the funds through TD Direct Investing. Do the dividends automatically get re-invested when you purchase the funds through your TD Mutual Fund account? You are right, in the TD Mutual Fund account, dividends for the e-Series funds are automatically re-invested, with no option to take it as cash instead. Amazing post! Thanks for *holding my hand* as I made my first purchases in the eseries! Keep up the good work on this blog! Happy to hear that it was helpful. Good luck on your portfolio! The fund is labelled as an RSP as opposed to an RRSP. Does that mean the funds within it can’t be used for the first time home buyers plan? Thank you. Do you need a TD chequing account to open a TD mutual fund account? I am currently with another institution. One of the reasons I moved to using TD Direct Investment instead of a TD Mutual Fund account is because I wanted to move my chequing account to a different. When I talked to a person in the bank, they told me the only way to contribute to a TD Mutual Fund account from another bank, was to set up a monthly automatic payment from another bank. I didn’t like this option, because I like to contribute different amounts at different times, and if I have excess funds, I like to add more. This wouldn’t be possible without having a chequing account with TD. If you are investing more than $15,000 and using a bank other than TD for your day-to-day banking, I would recommend going the TD Direct Investment route. Does this rule still apply today? I can’t find any information online about the automated monthly contribution you have to make if you don’t bank with them. Does that mean you have to call them every time you want to change the date of your payment and the amount as well? It’s been a year or so since I’ve talked to a TD representative about this, but I imagine it is the same. The idea was that you wouldn’t change the date or the amount of the payment – you would just have to stick to the schedule, which is why I didn’t like that option. You could speak to a TD rep to confirm whether this is still the case, but since TD Mutual Fund account was designed to work directly with a TD chequing account, my guess is that this hasn’t changed. 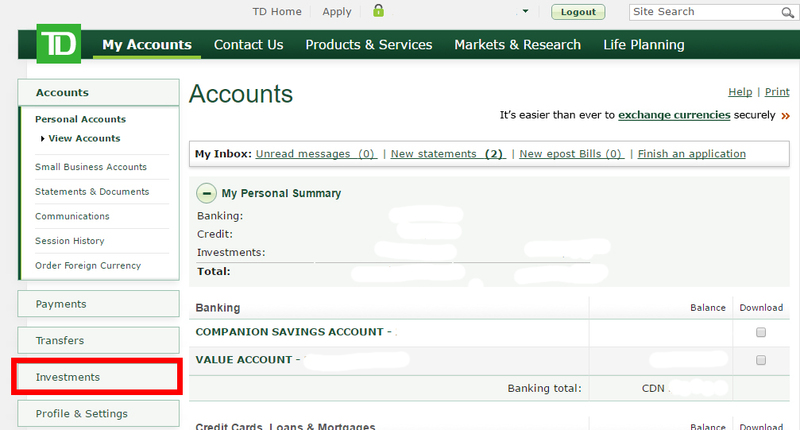 Currently im trading in stocks in my td direct investing account. If i want to buy a td mutual fund, is there a commission fee? If yes, how much? So I would suggest using this to preview the buy of whatever Mutual Fund you are thinking of purchasing, and seeing if there is any commission. I followed this and whenever I try to switch a mutual fund, it keeps saying “We have not processed your trade request because it may not be suited to your current investor profile”. I guess I would need to give them a call? I’m thinking of moving them to TD Direct Investment so that I don’t have this issue. I’ve had this exact same thing happen to me before. I needed to call in to the TD Easy Line and talk to an investment specialist, and they’ll need to update your investor profile. They’ll ask you a number of multiple choice questions, and you need to answer them in a way that shows you are willing to take on risk. If your investor profile shows you are willing to take more risk, then they will allow you to do more online. I called TD this morning and spoke with a specialist. They stated I had to open a mutual fund account (TFSA OR RRSP) in order to access index fund purchasing. They also said it was $25/month or $100. Does this seem right? Were you talking specifically about purchasing index funds, as opposed to TD e-Series funds? While they are very similar, e-Series funds are not technically ETF’s, which maybe could have caused some confusion. But a TD Mutual Fund account should be free (not $25 or $100) as well as have free transactions for TD e-Series funds (after being converted to a TD e-Series accounts). It seems like the information you received is a bit fishy. I would maybe say try a different representative, and confirm that you want an account that is capable of purchasing TD e-Series funds. You can point them to this page https://www.td.com/ca/en/personal-banking/products/saving-investing/mutual-funds/td-eseries-funds/ to clarify the products you are interested in (and can highlight the part about “No additional costs”)! What are the different ways to put money on a TD Mutual e-series fund? I have a TD Waterhouse e-series account and I set up a bills payment from my other FI bank account and funds will get transferred to the e-series as “Cash” then that’s the time I buy the different TDB’s. I do pay the maintenance fees of $100 a year since my investment is below $15K. My husband had to open a TD Mutual funds converted to e-series fund [only because we thought the TD Direct Investing branch was open on a Saturday but wasn’t so we went to the TD Canada Trust branch beside it] and you mentioned that there will be no fees for buying and selling. So for that we cannot set-up a bill payment type just like with the TD DI e-series account? When looking at the differences between using TD Waterhouse (TD Direct Investing) and TD Mutual Fund e-Series account, I think my article comparing the ways to buy TD e-Series funds might be helpful. Essentially, if you are investing under $15K, I would suggest going the TD Mutual Fund route, as you can avoid the $100 trading fee. If you don’t have a regular chequing account with TD, you can setup an authorized pre-payment plan to make contributions to your TD Mutual Fund account from a bank account outside of TD. You’ll have to go into your local TD Bank to set this up. But you won’t be able to contribute as bill payments like you would for TD DI – which is a downside, and one of the main reasons I moved to TD DI. You may also find helpful information on this blog post as well that talks about why someone may switch from TD Mutual Fund to TD DI. I hope that helps. Feel free to ask any other questions you might have. When you converted to TD Mutual Fund E series account can you still be able to purchase the Investor Series fund or you are restricted to just E series fund? I’m fairly certain that you should be able to purchase both once your account has been converted. Unfortunately, since I moved to TD Direct Investing, I no longer have a TD Easyweb Mutual Fund account, so I’m not able to pull up my account and see if both of the series are offered . If you want to be absolutely certain, I would call up a TD Mutual Fund specialist at 1-866-222-3456 option 5. 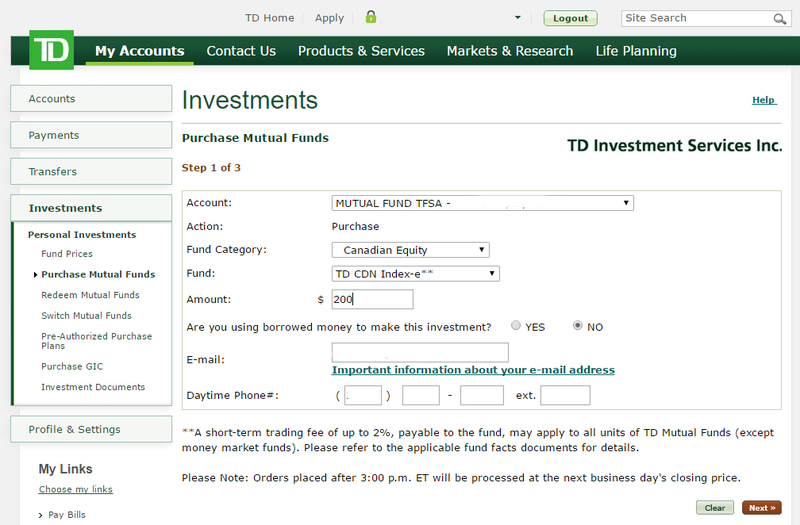 I opened a TD Mutual fund TFSA account and it is been over 10 days since the accout has been opened.I tried to purchase e series funds using my account and notice that i do not see funds that include the ‘-e’ at the end.For example, I select ‘Fixed Income’ form the Fund Caregory and then the options in the Fund show as ‘TD CDN Bond Index**’, ‘TD Short Term Bond**’ etc but it does not include ‘-e’ at the end. Do you think i should still wait for the account to be converted to e series? or am i missing something? Did you mail in the paperwork to convert your account, or did you do it with an in-person representative from the bank? Either way, I don’t think I would start worrying yet. Unfortunately, things like this can take quite a bit of time for the bank to process, especially since converting people to e-Series isn’t a high priority to TD, since they make more money off people who are on regular mutual funds. If you think of things in terms of weeks, I would estimate it would take 2 – 3 weeks normally, and maybe even a little longer. If it’s coming up on 21 days, that’s when you can maybe start making some phone calls to see what the status is. Thanks for the kind words. I always appreciate hearing from readers that they find my guides and articles helpful. Good luck with your investing! I have a question regarding tax issues. If I purchase index funds using e-series-index-fund platform to put in my RRSP, how do I get a tax receipt? Is a receipt emailed to you right away or mailed at a later date. Also if a person sells funds from my RRSP using this platform, is the tax taken off immediately at source before the money is transferred to my checking account? I am not clear on how the tax issue is handled by this platform. Many tnx. RRSP tax documents should be mailed to you at the end of the year (not every time you make a purchase). They should also be available online in the “Investments” section under the “Investment Document” page. As for selling funds from an RRSP, this is a little outside my area of knowledge, but I don’t believe the funds are taken off immediately. Instead, you would have to claim those funds as additional income on your next years taxes. As my general strategy is “don’t sell your RRSP funds” and I never have, you may want to talk with a tax consultant on the exact ramifications of accessing your RRSP funds early.